John & Richard Riley (1802-1828) 13.25 inch washbowl and 10.75 inch high (to the top of the handle) wash jug. The pattern is known as "Feeding Chickens." I watched "Gone With The Wind" last night on PBS. I read the book in the summer of 1958, when I turned 14, and saw the movie the same year. I loved it. I have seen the movie five times since then. Last night, I wasn't so enthralled by the movie. Scarlett seemed pig-headed and shrewish, and Rhett was way too old for her. I really felt Rhett did the wrong thing when he deserted Scarlett, Prissy, Melanie and her newborn baby to join the Rebel army. What seemed romantic when I was young, just looked negligent and self indulgent to me now. However, I digress. I saw something in the movie that I hadn't see before. 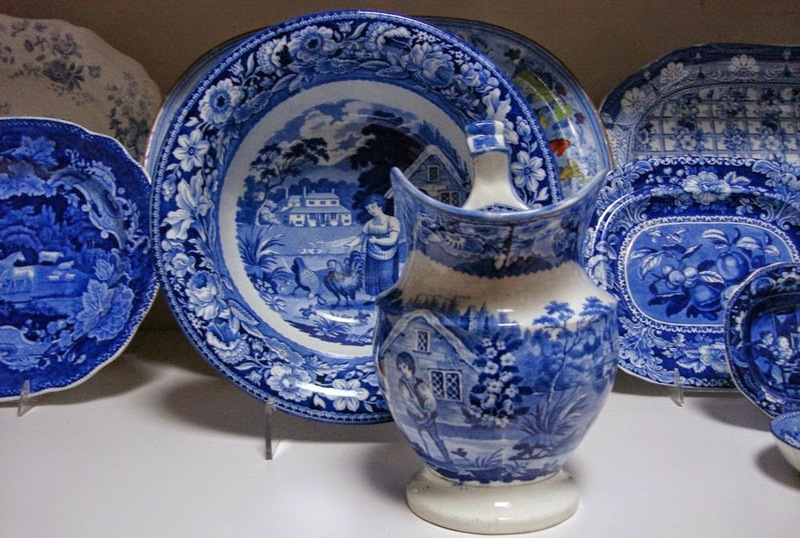 In the scene where Melanie is having her baby, Scarlett picks up a circa 1820s blue transferware wash pitcher to get some water. She lifts it out of a large washbowl. The pitcher and bowl get about three minutes of time in the three hour movie, but I was riveted to them. I wish I could identify the pattern. Oh well. I will have to show you my pitcher and bowl instead. John & Richard Riley (1802-1828) 13.25 inch washbowl and 10.75 inch high (to the top of the handle) wash jug. The pattern is known as "Feeding Chickens. 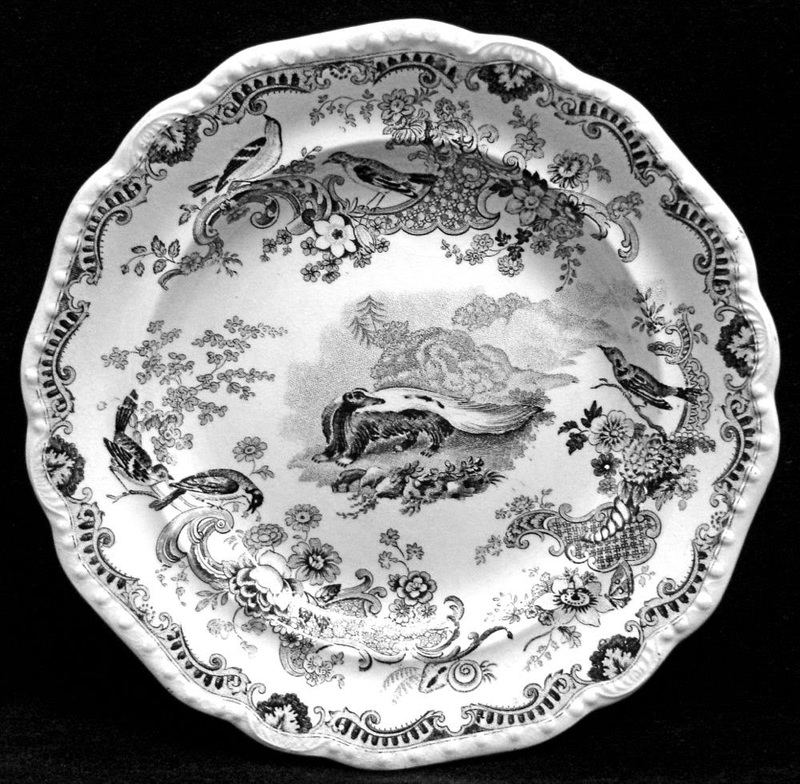 "/Notice the outside of the bowl is printed with the border pattern. Next time you watch the movie, keep your eyes open for the pitcher and bowl, and let me know the pattern! As a little girl, I always enjoyed thinking about the Ten Commandments. Some were seemingly so unambiguous; "Thou Shalt Have No Other Gods Before me, Honor Thy Father And Thy Mother, Thou Shalt Not Kill! I liked the clear commandments. However, others were not so clear; thou shalt not covet was unclear until I learned it meant desiring what someone else has. As the oldest child in my family, I understood that! I always wanted a younger sibling's toys or their demands on my mother's time and affection. 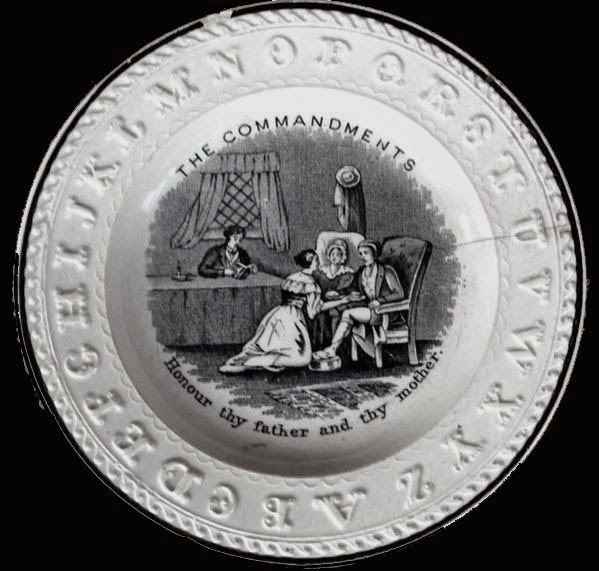 Children's patterns were often Sunday School awards or gifts, as well as the starting point for education. 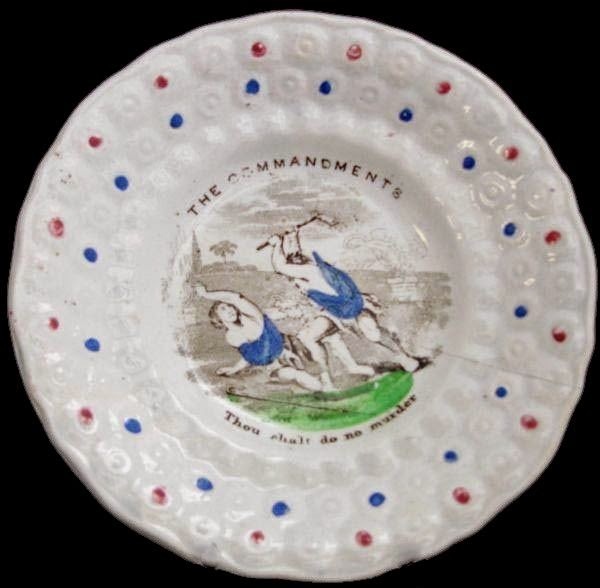 I wasn't surprised to find children's plates illustrating a Commandment. 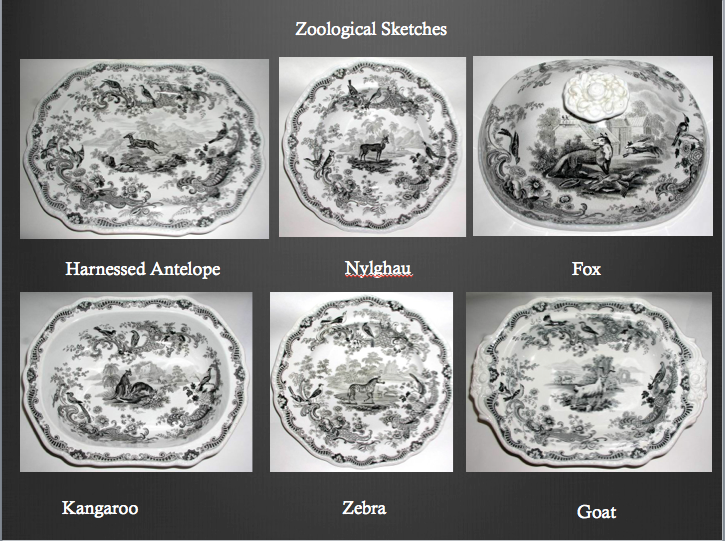 I only have two plates to show you, but a few are found in books about Children's patterns: A Collector's Guide to ABC Plates, Mugs and Things by Mildred and Joseph Chalala illustrates "Thou shalt not make to thyself any graven image" and Children's China by Pauline Flick shows "Thou shalt not covet thy neighbor's house." I look forward to finding all ten. I have written about source prints before (see a bunch below). 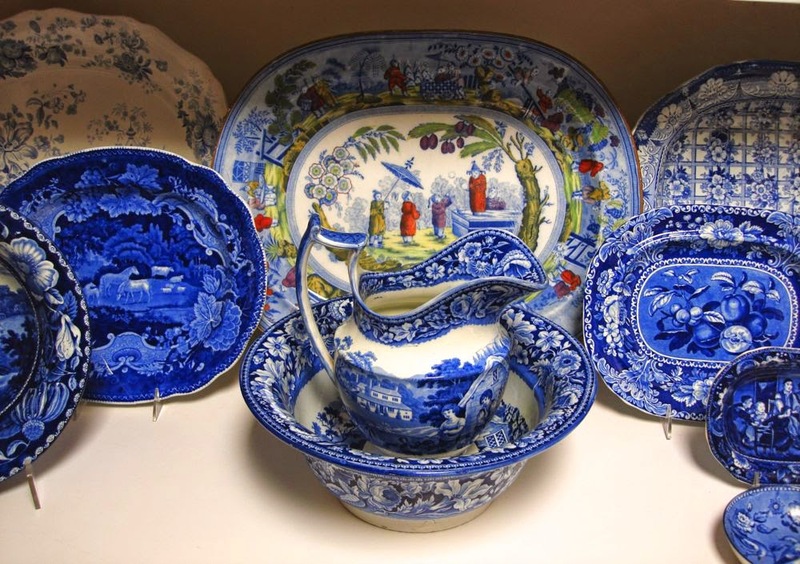 * A source print was quite literally the source for many early transferware patterns. 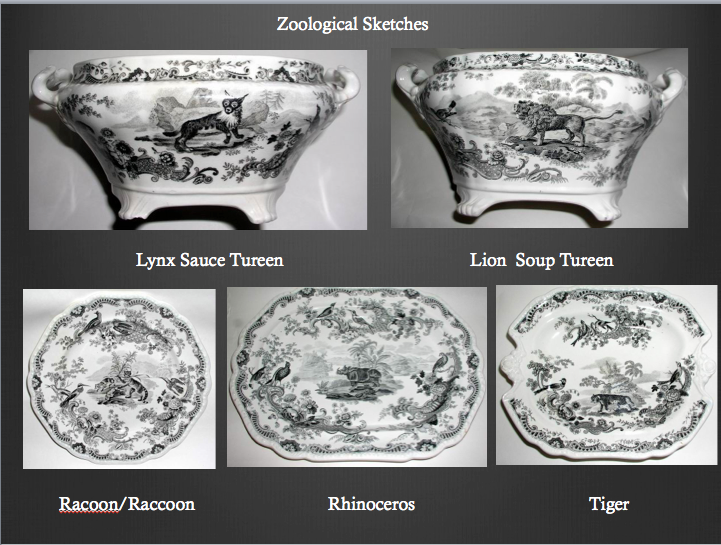 The patterns were copied from popular books and art works without compensation to the artist. This was before the advent of the stricter British copyright laws of 1842 and 1844. I love finding source prints. They fill my need for more information; who drew the original pattern and why. 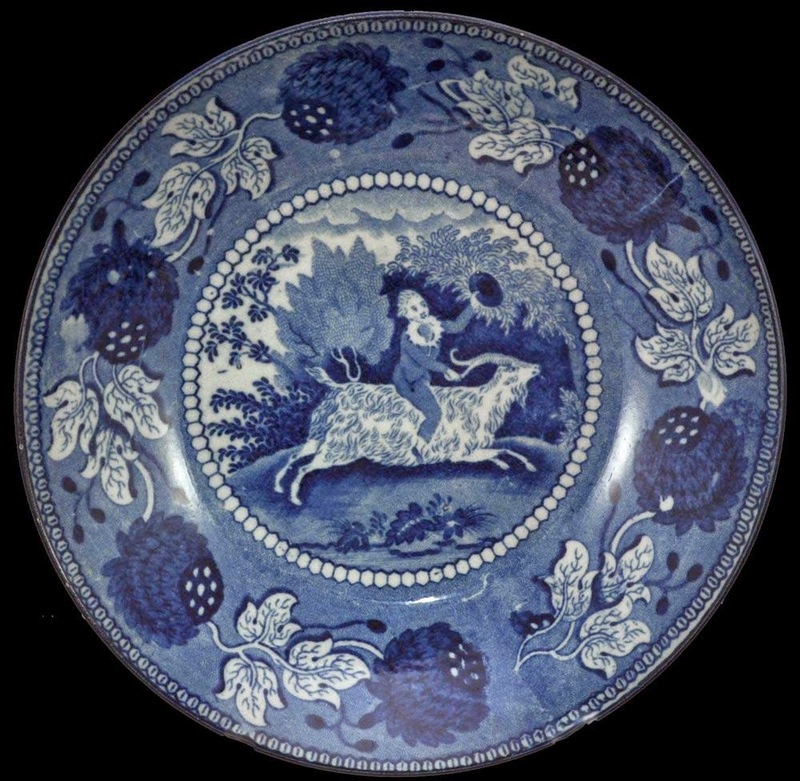 A saucer with a boy riding a goat appeared on eBay recently. The pattern looked familiar. 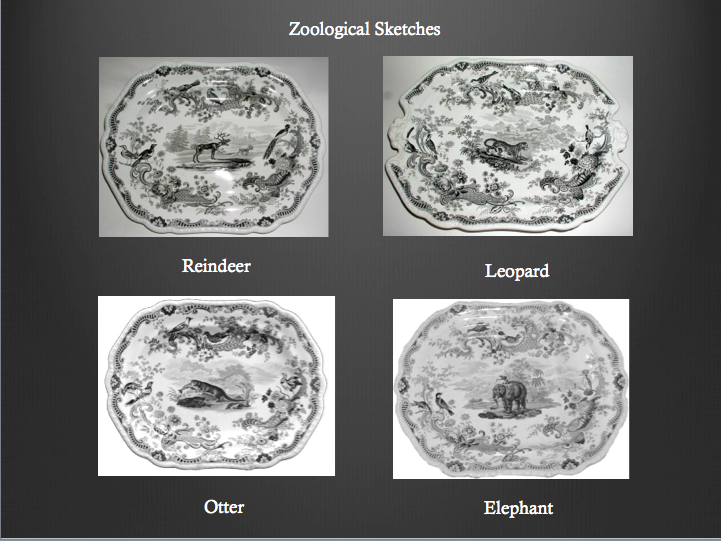 Whenever I see a pattern with an animal, I go to Thomas Bewick's A General History Of Quadrupeds, 1790. 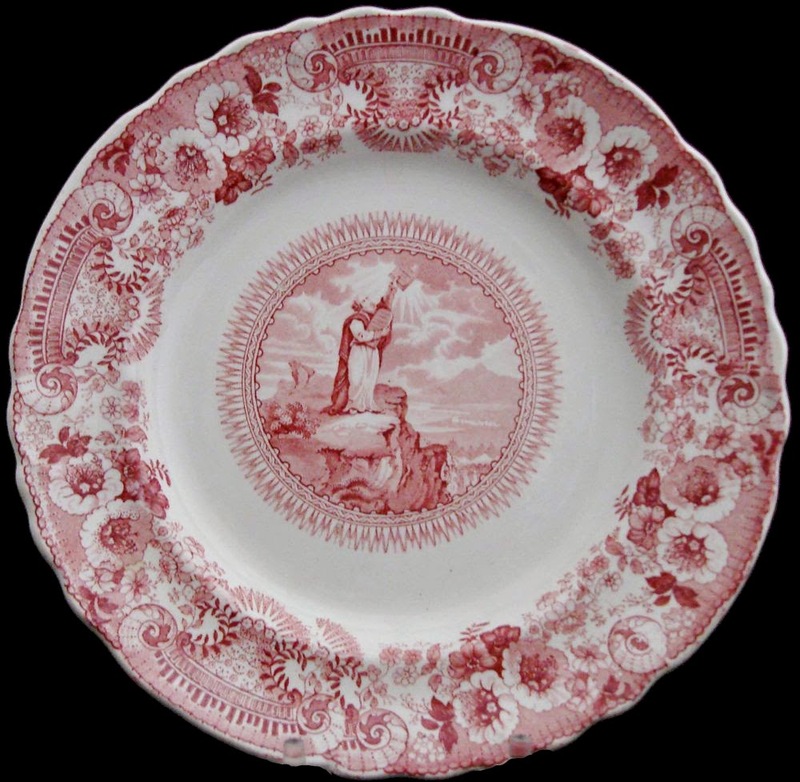 I knew the pattern was probably at the end of one of the chapters, as Bewick had the habit of drawing a vignette or tail-piece to punctuate each chapter. Sometimes the vignette is related to the chapter and sometimes not. So I looked through much of the book before I spotted the boy riding the goat. It appears at the end of the chapter titled "The Common Goat." I could have saved myself a lot of time if I had just gone there first! However, as I perused the chapter vignettes, I found another print that looked familiar. It was at the beginning of the chapter titled "The Domestic Cat." I have never paid much attention to the pattern before. 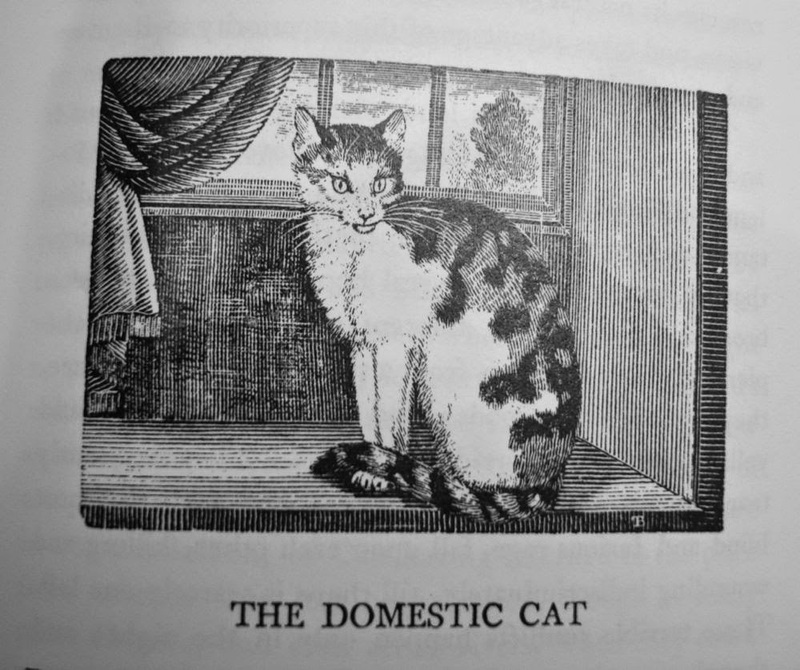 Unlike Bewick's dogs (there are many), there is only one domestic cat. I find it interesting how the brain can suddenly resonate with something that it ignored before. 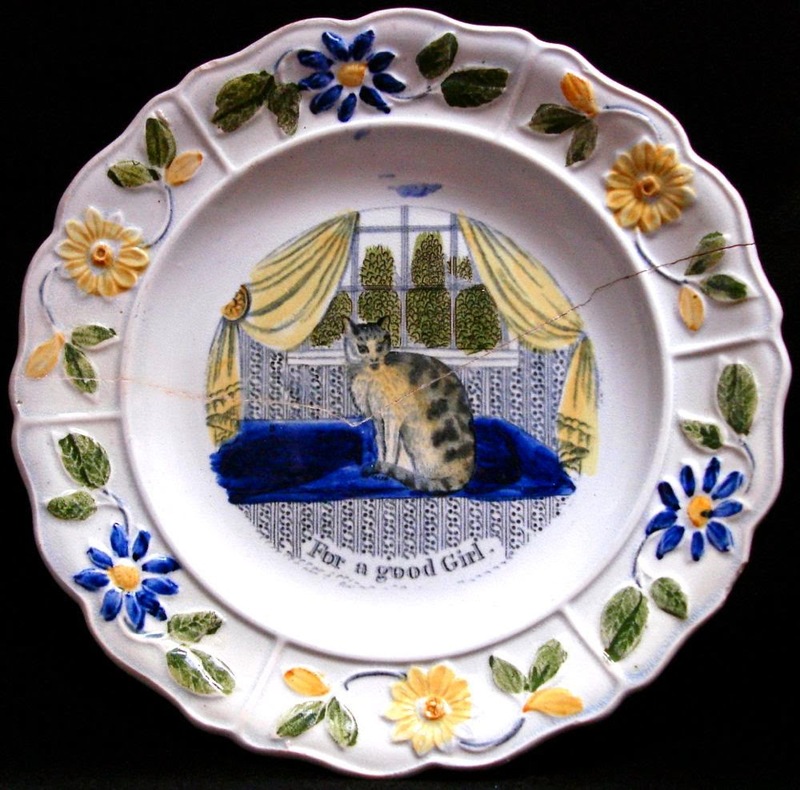 One of my favorite children's patterns features a cat coupled with the text "For a good Girl." The combination of cat and text is irresistible to me as I love cats and one very special (to me) little girl. I wasn't looking for the source print, but I found it anyway! Source print for the above plate is from Thomas Bewick's "A General History Of Quadrupeds." It features at the beginning of the chapter titled "The Domestic Cat."